Allison joined CrossFit Platinum 5 years ago. 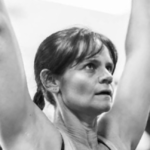 She is a Level 1 qualified CrossFit Coach as well as a qualified CrossFit Kids Coach. She has taken part in various CrossFit competitions including UWS, Last Team Standing and Virtuosity Games and has a Brown Belt in Goju-Rye Karate. Allison is married with two teenage sons and when she isn’t coaching, has a job in advertising.